For the mother of a new baby, blogging is likely to be the last thing on her mind. Taking care of an infant is an almost incredible amount of work, and between changing diapers and putting the final touches on the nursery, it seems unrealistic to imagine that there would be time left over for any mother to blog. However, a growing number of new moms are joining the blogosphere to share their experiences during this exciting time of life. There is a whole range of benefits that new mothers can reap from blogging, and the spectrum covers everything from getting through the night to helping distant relatives feel closer. Among the reasons why, for a mom dealing with the hassles and triumphs of a baby, blogging is a great idea, is that having a blog about motherhood is a great way to blow off some steam. Babies often have very erratic sleep patterns that leave parents up at odd hours of the night, and sometimes the best way to fill those hours is on the internet. Many new moms turn to television to help them weather these dawn vigils, but by blogging through the night moms can turn what feels like a somewhat depressing situation into an actively positive and productive one. Another reason why new moms often find blogging very satisfying is that it helps them to be a part of a community. For moms who are not able to successfully juggle a full social life with the very tough demands of taking care of a new baby, blogging can be a great way to stave off the isolation that sometimes comes with this stage of life. A baby requires constant attention, and it can be difficult to attend social gatherings or events when you are responsible for an infant. Luckily, the blogosphere is full of other moms in the same situation, and by chatting with them it is possible to overcome some of the loneliness that many new mothers are surprised to encounter. Of course, for a mom with an adorable new baby, blogging can be as much about celebration as it is about necessity. Having a blog about living with a new child can give mothers the chance to reflect on how powerful and warm the sensation of motherhood is, and sometimes sharing the triumphs of this unique time can make them even sweeter. 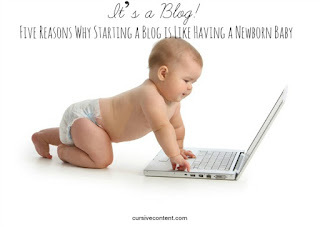 A blog is a great way to keep friends and family updated with news about your baby's first words or first steps, and with new technology it is easier than ever to make photos and video clips a part of your blog, so you can give far-away relatives the chance to feel much more involved in your child's life.